Now for the birthday gifts... 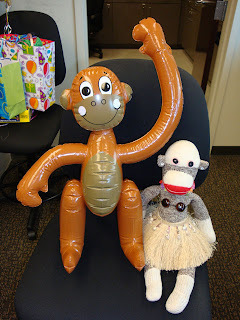 This fellow says he's the king of the jungle, but I say he's full of hot air! He bears a remarkable resemblance to one of my Facebook friends named Cletus. 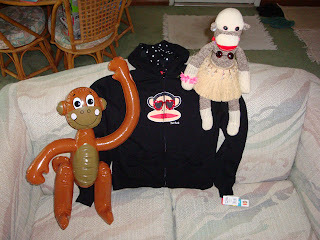 Cletus' clone and I both gave the opposable thumbs up to this Paul Frank Julius hoodie sweatshirt. All around the mulberry bush, the monkey chased the weasel... 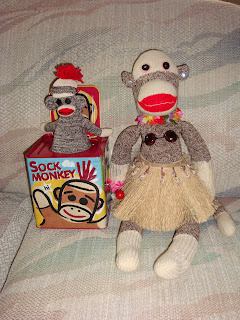 POP, goes the monkey! Turn the crank and this little buddy pops out of his box. 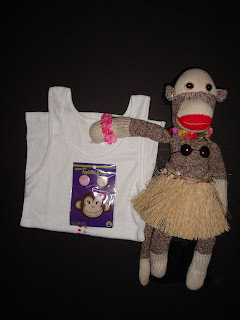 We're going to iron on this cutie girl monkey patch to make a custom tank top that will be sure to turn heads. I received a cool pair of work boots which I've been asking for a while. 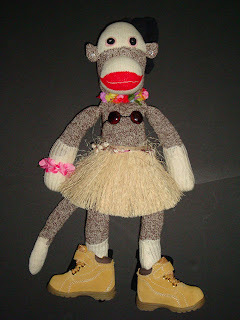 They don't quite go with my Hawaiian garb, but who cares? I've been known to start my own fashion trends.